WATCH THIS SPACE FOR THE OFFER OF THE WEEK.. A NEW OFFER EVERY THURSDAY!! 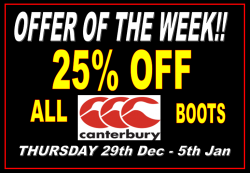 25% OFF ALL CANTERBURY RUGBY BOOTS! !